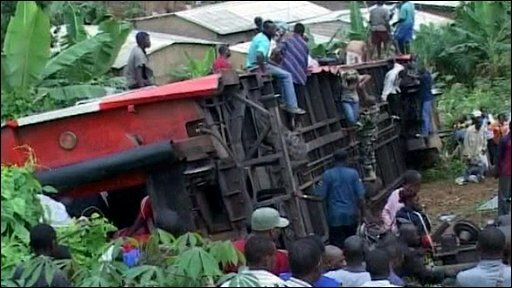 At least five people have been killed and more than 275 others injured in a train crash near Cameroon's capital, Yaounde. Officials said that a passenger train carrying about 1,000 people derailed north of the city. Rescuers are searching for survivors and say the death toll could rise. On Friday a fuel train derailed south of Yaounde, killing at least one person and starting a blaze that took four hours to put out. "These two days have been very unfortunate for our national railway carrier," said Communications Minister Issa Tchiroma Bakary. He said the passenger train had come from the northern town of Ngaoundere. In Friday's incident, 11 wagons carrying diesel fuel and petrol were destroyed in the blaze. The government has set up inquiries into both incidents, national media reported.